The ReThink Disposable team has been hard at work encouraging businesses to reduce their use of plastic straws. One of our greatest lessons learned these past few months is that every voice counts. 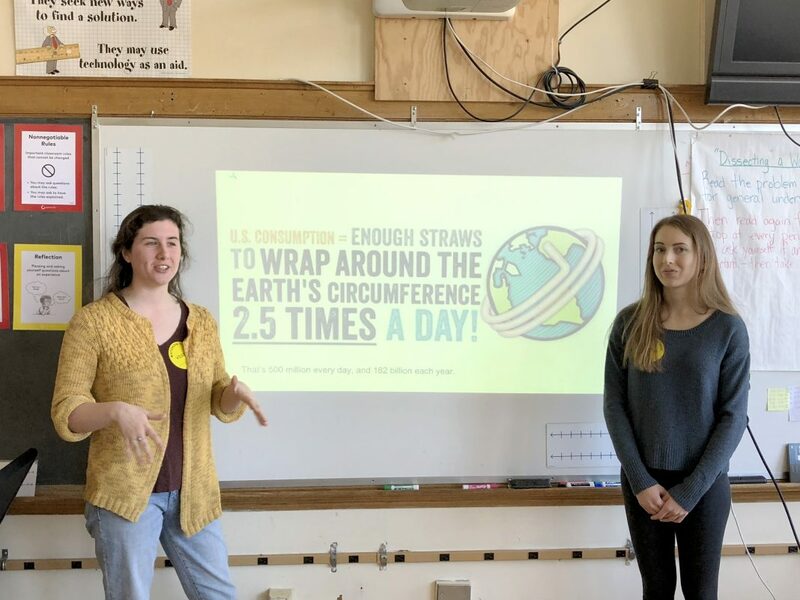 This Spring, not only did we speak with business owners, we partnered up with local fifth grade students eager to spread the word to help save marine life. The collaboration started when 5th grade teacher Drury Thorpe read an article in her local paperabout ReThink Disposable’s work in her town. While she was reading she realized that the director of ReThink Disposable in Montclair, Maura Toomey, was one of her old students. Thorpe had been teaching an elective class about the ocean and ocean pollution to her students and reached out to spark a collaboration. A few weeks later, the ReThink Disposable team found themselves inside a bustling 5th grade classroom full of the next generation of environmental activists. Despite being fully prepared to explain every detail of the issues with plastic, they were surprised by how much the students already knew. After speaking with the class, each student was tasked with choosing a local restaurant and writing a letter explaining the problem and expressing why they wanted the business to reduce their use of straws. Once the letters were finished, Thorpe and the team strolled through town with the exuberant bunch of students to hand-deliver each letter to its receiving restaurant. We are currently in the process of following up with these businesses to officially register them in the Straws by Request program. It is encouraging to see how well-educated these children are about environmental issues. This kind of formal education on climate change and pollution was not around when I was in school, which has made eco-friendly practices and behaviors much more difficult for my generation to adjust to. These kids, on the other hand, are acutely aware that their daily decisions and actions have a direct impact on the environment. Their knowledge is sound and their voices are clear, it is important to make sure they have the chance to be heard. Big or small, young or old, every voice makes a difference. To read the full article in the Montclair Local, click here.